Who doesn't love jam? When I think of jam, I imagine a sweet treat to spread on English muffins, biscuits, or bread along with a slab of butter. Other than a quick and flavorful spread, fresh jam comes in handy in a variety of ways. It can be used as a filling for cookies, cakes, and pies. It can even be mixed in with plain yogurt or oatmeal to add a little sweetness. 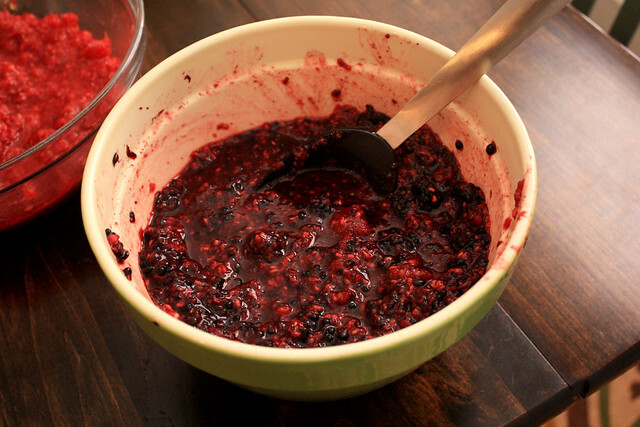 If you have access to berries, you should be making jam. Don't be worried about whether you have the time to make jam or not, because you can make jam in 5 minutes with this simple method. Jam can achieve a good consistency almost instantly with the use of chia seeds. Flax seeds can also be used. That means no cooking, no gelatin or pectin, and the quickest berry jam known to man. Chia seeds are full of antioxidants, fiber, minerals, and omega-3 fatty acids, which kicks the nutritional value of your berry jam up a notch. Use honey to naturally sweeten your jam instead of refined sugar. Because it's not heated, you'll also get all the benefits of fresh honey mixed right in. The result is a fresh berry jam that is actually 100% good for you! As for preserving your jam, it will keep for up to 2 weeks in the fridge or up to one year in the freezer. I recommend keeping your jam in freezer jam jars. Yum! Quick and easy doesn’t hurt either! Yes. Please. This makes ‘jammin’ so much easier!! Want to try this asap! !